Text published in DA Transactions, 1920. Mr. Robert Burnard who died on the 15th April, 1920, was the son of the late Mr. Charles Frederick Burnard, one of the founders of the firm of Burnard, Lack, and Alger, manufacturers of chemical and other fertilizers, Mayor of Plymouth in 1881-2 and Liberal candidate for St. Ives not long before the borough was disfranchised. Mr. Robert Burnard was associated with his father and his father’s partners in the business. Eventually the style of the firm was changed to Burnard and Alger, Ltd., of which at the time of his death he was the senior partner. The business, originally located in Sutton Road, was removed to Cattedown during the lifetime of Mr. C. F. Burnard, and the waterside premises then acquired were later developed by the late Mr. W. H. Alger and Mr. R. Burnard for important deep-water wharves, with spacious warehouses and modern equipment, thereby adding greatly to the accommodation of the port. Mr. Burnard was for many years chairman of the Cattewater Harbour Commission. In politics he took an active part, especially in the Tavistock Division, and was a supporter of the Liberal party. He was chairman of its divisional association, and proved an effective platform speaker, working hard to secure the return of the late Mr. Hugh F. Luttrell. Probably very few politicians aroused less personal enmity by their political activities. In the split over the Home Rule Bill he remained loyal to Mr. Gladstone. In all matters, public and personal, he kept an unruffled temper, while resolutely maintaining his views. Successful as a business man, and one to whom the town and port of Plymouth was indebted for the growth and maintenance of trade, he carried the same thoroughness into other interests, and especially to the protection of the public rights on Dartmoor and the exploration of the antiquities of the moorland. Although a lifetime lover of the moor, it was not until the year 1887 that he published any paper on the subject of its antiquities. In that year he read before the Plymouth Institution a communication entitled “Recent Dredging in Cattewater”, a subject which led him to the consideration of the early miners and their works, the result being that in 1888 he contributed a paper on “The Track of the Old Men, Dartmoor”. Once started on this line of research, he pursued it with patience and with a happy contempt for the merely speculative. This soon earned for him the repute of being one of the soundest and best-informed of our local archaeologists, especially upon matters prehistoric. In 1891-92 he was president of the Plymouth Institution. In 1894, dissatisfied with a mere superficial knowledge of Dartmoor which had been sufficient for earlier workers, such as the Rev. E. Atkyns Bray and Mr. S. Rowe, he decided systematically to excavate the Hut Circles. “The Exploration of the Hut Circles in Broadun Ring and Broadun”, published in the Transactions of the Devonshire Association for that year, gave the first reliable account of the Hut Circles. In the same volume the first report of the Dartmoor Exploration Committee appeared, followed in subsequent years by many further Reports in the preparation of which he took a leading part. Grimspound was thoroughly explored and the results described in the above-quoted Report. With the Rev. S. Baring-Gould, assisted by Mr. George French of Postbridge, over one hundred hut-circles, the stone rows, and such cairns as had not been rifled by tin-workers, were examined, establishing without doubt that all pertained to a period long anterior to tin mining on the moor, that is to the prehistoric age of flint, when bronze was hardly known, and the belief that these stone monuments, hitherto supposed to be the work of the Druids, was without foundation. The next point he studied, also in collaboration with the Rev. S. Baring-Gould, was the period of the construction and occupation of the camps that surround Dartmoor. The Tregear Rounds in Cornwall were similarly explored in company with the Rev. S. Baring-Gould, the Rev. J. K. Anderson of Petertavy and Mr. J. D. Enys of Enys; and again, in 1904, with the Rev. S. Baring-Gould, other explorations were made in Wales. In Cornwall, the camp explored in St. Kew parish, supposed to belong to the Arthurian period, proved to be prehistoric and no trace of British occupation was found, and as to the Welsh Camps, though the majority were prehistoric, there was evidence of later occupation. But the camps about Dartmoor proved to be all prehistoric, without any traces of British or Saxon occupation, and in some, notably in that on Whit Tor, there were several cairns of stones supposed to be raised over the dead. In some of the Welsh Camps where similar cairns existed, when cleared away they were found to be piles of stones, collected as ammunition for defensive purposes, without any traces of burial. 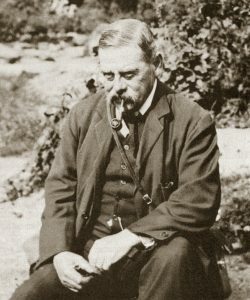 In 1895 he co-operated with the late Mr. Thurstan C. Peter in the exploration of Carn Brè, near Redruth, and important results followed their efforts. Later, he was associated with the excavations near Harlyn Bay, near Padstow, in which, however, he did not take a leading part. His connection with the Dartmoor Preservation Association should especially be placed to his credit. His own contribution to its publications, “Plundered Dartmoor”, is as important to those who wish to preserve it for the public as are his antiquarian papers to workers in that field. He advocated the acquisition of the moor as a county park by the Devon County Council. Although he failed to realize that ideal, he was ever on the alert when public rights on the moor and its prehistoric relics were menaced, as they often were. To the end his interests in the moor never slackened, and in August, 1919, from a very sick bed he wrote a letter, published in the Western Morning News, protesting against the spoliation of Dartmoor by contemplated schemes of land reclamation and the utilization of its waters at disfiguring electric-power stations. A photographer of ability, he published in four volumes “Dartmoor Records”, with illustrations reproduced by a permanent process from his own negatives. The pictures are typical of the moor in its many phases, and the books hold an assured place in local literature. In addition to the Reports of the Dartmoor Exploration Committee, Mr. Burnard contributed several papers to the Transactions of the Devonshire Association of which the following are the principal, viz. : “Dartmoor Stone Implements and Weapons” (XXIX, 378); “News from the West” (XXI, 210); “Notes on Dartmoor Kistvaens” (XXII, 200); “The Great Central Trackway—Dartmoor” (XXI, 431); “The Ancient Population of the Forest of Dartmoor” (XXXIX, 198). In 1900, Mr. Burnard was elected a Fellow of the Society of Antiquaries. For many years he was a member of the Teign Naturalists Field Club, an honorary F.S.A. of Scotland, and a Justice of the Peace. He joined the Devonshire Association in 1887, acted as one of the Honorary General Secretaries in 1908-9, and was President in 1911, when the Association met at Dartmouth. In his address he sketched the low conditions of Dartmoor and the South of England during the prehistoric period as compared with the more advanced civilization of Egypt during the same and even earlier times. In 1904 Mr. Burnard gave up his home at Hillsborough, Plymouth, and for about seven years lived at Huccaby House, seven miles from Princetown on the West Dart. More recently he lived at Stoke-in-Teignhead, and afterwards made Torquay his home. He travelled abroad in later years, visiting the Malay Peninsula, and making more than one journey to Egypt, the antiquities of which country especially interested him. This was evidenced by seven lectures which he delivered at the Plymouth Institution, including “A Dreamer of Ancient Egypt—Akenaton”, given in 1917, and “Crafts and Customs of Ancient Egypt” in 1918. Mr. Burnard married, 6th April, 1871, Fanny Louise, daughter of Mr. and Mrs. S. H. Pearce of Paignton, who died 17th August, 1919, and leaves four children: Mr. Lawrence Burnard, a director of the firm of Burnard and Alger, Ltd., and a son-in-law of the Rev. S. Baring-Gould; Major Charles Burnard, D.S.O. ; Mrs. Munday, wife of Surgeon-Com. Munday, C.B., R.N. ; and Mrs. Lake, the wife of the Rev. K. A. Lake, rector of Stoke-in-Teignhead. * For many of the particulars contained in this memoir, the Editor is greatly indebted to the Rev. S. Baring-Gould and the Western Morning News, and gratefully acknowledges the same. Previous item Masson Phillips, E. N.